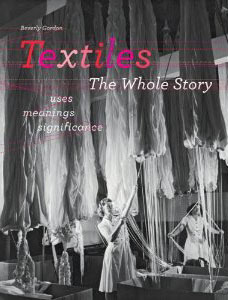 Beverly Gordon, author of Textiles: The Whole Story, Uses, Meaning, Significance from Thames & Hudson, has an ambitious aim. “My intention” she writes, “is to shine new light on the light on the taken-for-granted but fascinating subject of the roles and meanings that textiles hold in cultures throughout the world. I hope to make it undeniably evident that to be human is to be involved with cloth.” To do that, she takes readers on a dizzying trip across centuries and continents and beyond, from the linen strips that cover a mummy in Egypt circa 150-175 CE. to the fluropolymers protecting an astronaut as he walks in space in this century, with stops at Betsy Ross in colonial America, Mohandas Gandhi in colonial India, women glass spinners in Murano, Italy in 1905 and the Renaissance, where women worked on textiles in groups, along the way. In sections covering textiles and human consciousness, human survival, social meaning, money, status and control, meaning and beauty and the spiritual significance of cloth, Gordon provides insights and information for anyone with an interest in textiles and all they entail. 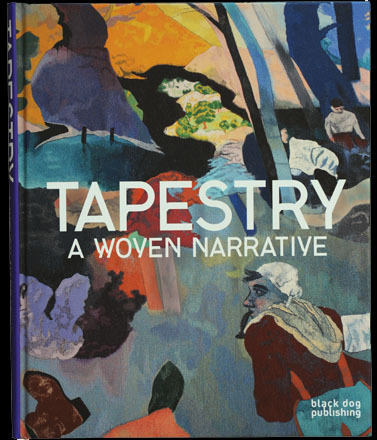 Tapestry: A Woven Narrative also takes the long view, providing a general introduction to the state of artisan tapestry weaving in the 21st century by way of contextual essays outlining developments from the Middle Ages to the modern age. In addition to the essays, the book also includes illustrated profiles of contemporary weavers, including Jo Barker, Sara Brennan and Sue Lawty — along with studio profiles of Dovecot and others. Tapestry: A Woven Narrative is available from browngrotta arts. “I always think of my art like a dance – it leads and I follow. 1966, my second semester in college, just out of high school, I took an Introduction to Art class. The instructor introduced a medley of visual art projects, and two were textile related. I spent late nights in the living rocm weaving on the large frame loom I built in class. I actually coaxed my mother to help me embroider on the other textile project I designed. She dyed it, and I only felt a little bit guilty. She and I would chat into the evening instead of being glued to the TV. In 1973, when I moved north from southern California to Healdsburg, I discovered the Pomo culture. In my first basketry class at the local “Indian School,” Mabel McKay, instructor and tribal leader, asked me if I had an awl. She showed me hers, passed down for generations. I returned to the next class with an altered antique screwdriver I turned on a grinder and then finely sanded into a very authentic awl. She was impressed, and I saw my artistic path continuing ahead of me. I still use my awl as I assemble my vessels. When the gallery and museum world opened up to me as I finished undergraduate work ,and continued to be there for me through graduate school and beyond, the memories that attached to my soul were the complimentary notes often written on the packing of a returning art piece. I also remember New York gallery owner, Warren Hadler, bent way over at an exhibit with his head all the way inside a very large paper vessel I’d made in graduate school. Mildred Constantine, former curator at MOMA, stopped a slide show at’ the Allrich Gallery in San Francisco to ask, ‘Who made the paper baskets?’ Restaurateur John Ash, on returning from New York years ago finally reached me after numerous telephone messages asking me to call. After our telephone-tag he told me he saw my ‘beautiful work in New York’ and couldn’t believe I actually lived in Healdsburg. Pepich: The majority of the artists in this collection are American women. So this was intentional? Cotsen: Yes. The acquisition of women artists’ work was an intentional statement on my part. In Japan, most of the basket makers are men, but when I looked at what was going on in the United States, I noticed that the majority of the artists advancing the field at this time were women. I found a great deal of experimentation that was moving contemporary basketry — and the fibers field in general — in many new directions. 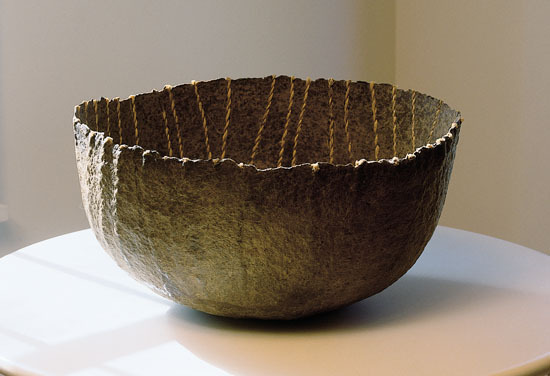 There are a few men and also some British and Japanese women artists who are included in this group because they actively participated in the American basketry movement as teachers and exhibiting artists. However, the great majority are American women. 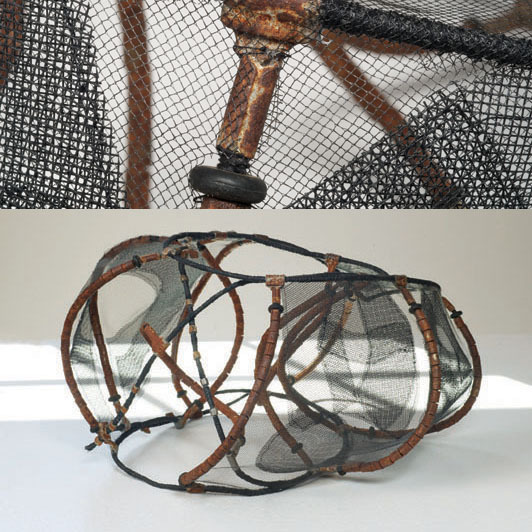 I am most frequently drawn to what the women basket artists see in the materials they employ and the forms they create. These artists seem to have an innate closeness to the earth; it interests me to see how they express that through their work in fibers. 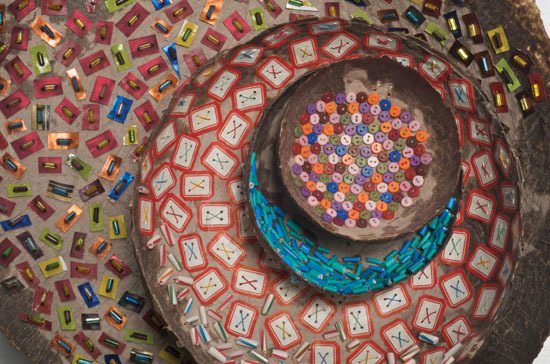 Historically, women carried baskets as storage containers or created other textile forms; contemporary basket artists share a connection with their predecessors in the understanding they have for basket materials and forms. I think contemporary works are more interesting than classic American folk baskets. I did not want to have the pieces in this collection mistaken as purely functional, but viewed as innovative sculptural statements. Functionality is not important to me; it can be a limitation. I am interested in aesthetic and shape. When I first started collecting, there were few people systematically assembling contemporary basket collections. I wanted to encourage the development of these artists’ aesthetic concepts by acquiring their works. Basketmakers in the The Cotsen Contemporary American Basket Collection: Dona Anderson;* Joan Austin; Michael Bailot; Dorothy Gill Barnes;* Patricia Barrett; Dail Behennah;* Nancy Moore Bess;* Linda Bills; Delores L. Boyer; Joann Segal Brandford; Nancy Braski; Brent Brown; Jan Buckman; Chunghi Choo; Jill Nordfors Clark; Akemi Daniells; Dane Dent; Rob Dobson; Jean and Rob Doubert; Jeanne Drevas; Lillian Elliott/Pat Hickman; Norma Anderson Fox; Therese Neptune Gardiner; John Garrett; Lindsay Ketterer Gates; Mary Giles;* Maggie Henton; Marion Hildebrandt; Patti Q. Hill; Kazue Honma;*Flo Hoppe; Christine Joy*; Tamiko Kawata*; Jane Kerseg-Hinson; Susan W. Kilmer; Naomi Kobayashi;* Gyöngy Laky;* Shereen LaPlantz; Kari Lonning; Elaine Lucero; Mika McCann; Connie/Tom McColley; John McQueen;* Merkel-Hess;* Doris Messick; Sally Metcalf; Norma Minkowitz;* Diane Moore; Debora Muhl; Judy Mulford;* Dulese Myers; Dennis Nahabetian; Leon Niehaus; Jane Niejadlik; Linda Kelly Osborne; Francina Kraynek Prince; Emily Borden Ragsdale; Lois S. Rainwater; Fran Reed; Jill Romanoke; Ed Rossbach*; JoAnne Russo; Betz Salmont; Hisako Sekijima;* Corey Shenkin; Karyl Sisson;* Thurmond Strickland; Billie Ruth Sudduth; Polly Adams Sutton; Ema Tanigaki; Deborah Valoma*; Don Weeke; Jiro Yonezawa. * An asterisk indentifies artists whose work will be included in Retro/Prospective: 25+ Years of Art Textiles and Sculpture at browngrotta arts this fall. We vacationed in Maine last month and included one fiber-related stop in our itinerary. Just up Route 1 from Camden is the headquarters of Swans Island Blankets. 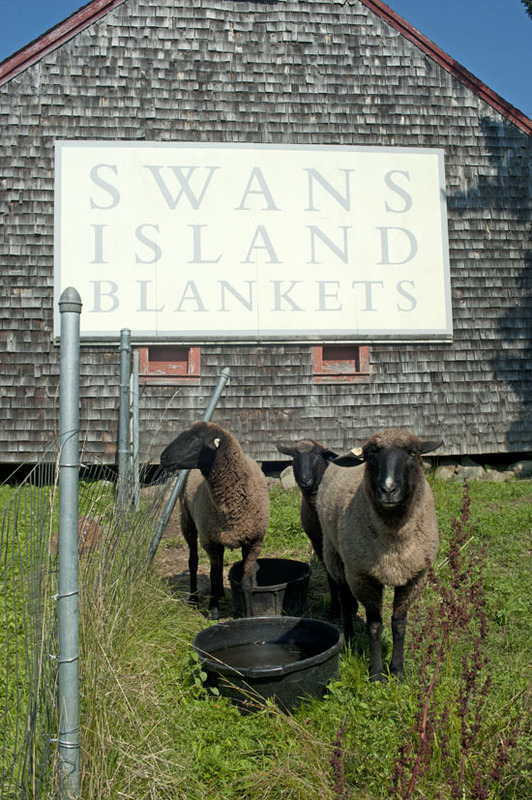 Twenty years ago, John and Carolyn Grace moved to Swans Island, off the Maine coast, to make blankets from the wool of hardy island sheep. The new setting (since 2003) in Northport is idyllic, the sheep there are welcoming and the beautiful handwoven summer- and winter-weight blankets and scarves are artfully displayed. Swans Island is a recipient of a Smithsonian Blue Ribbon for Craft. 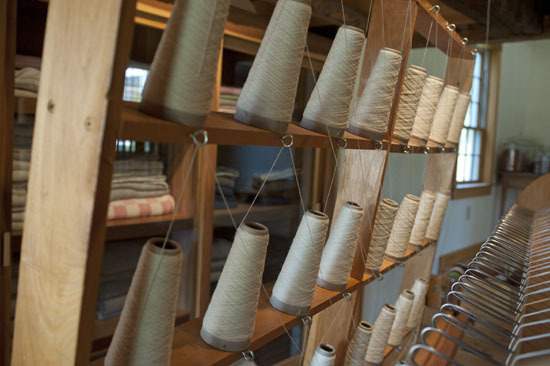 The wool is hand dyed, using only natural materials; all weaving and finishing is completed on site — though most of the sheep remain on the Island. The rare wool and equinox blankets are made from wool of naturally brown and black sheep. The blankets, throws and scarves are trimmed in silk. 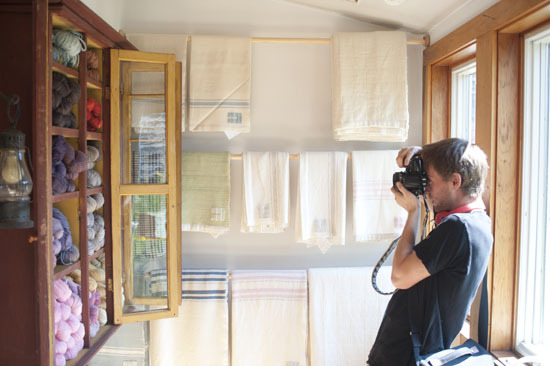 You can view the works online http://www.swansislandblankets.com/— and don’t miss an opportunity to visit. This fall we will present a catalog exhibition, Retro/Prospective: 25+ Years of Art Textiles and Sculpture in Wilton, Connecticut from October 26th to November 4th to commemorate browngrotta arts’ 25 years promoting international contemporary art. The comprehensive exhibition will look at the past and future of the art textile movement, and as always, include related works in ceramics and wood and mixed media. There will be works in the exhibition by pioneers of the contemporary textile art and sculpture movement and there will be current work by established and emerging artists, to explain where the movement is now and provide a sense of what’s ahead. The artworks selected by browngrotta arts for Retro/Prospective: 25+ Years of Art Textiles and Sculpture express a powerful sensibility. John McQueen was persuaded to take the dramatic sculpture, Centered, begun in 2007, from his personal collection and place it on display. 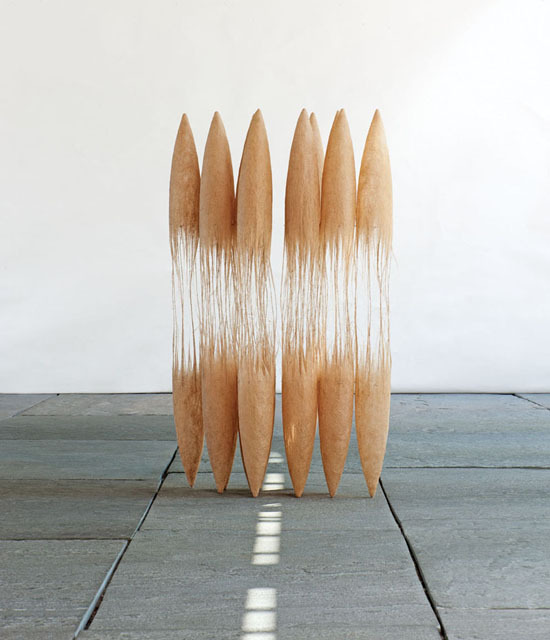 Naoko Serino’s ethereal Generating 12 is from her most current body of work. Sue Lawty’s Calculus is a contemplation made of thousands of tiny stones, from a series she began as artist in residence at the V&A, While Chris Drury’s Roussillon I, takes viewers on a visual adventure by combining rubbed ochre on paper and a woven map. The artists in Retro/Prospective: 25+ Years of Art Textiles and Sculpture come from a wide range of countries and art backgrounds. They utilize diverse materials and techniques. Some, like Lia Cook and Gyöngy Laky from the US, are mid-career artists who have achieved international recognition. Others, like Laura Thomas of the UK, Jennifer Falck Linssen of the US and recent graduate Stéphanie Jacques of Belgium, are emerging talents. The work of others, like Chang Yeonsoon, 2008 Artist of the Year at the National Museum of Contemporary Art in Seoul, Korea and Grethe Sorensen of Denmark, has been celebrated abroad, but only rarely shown in the United States. 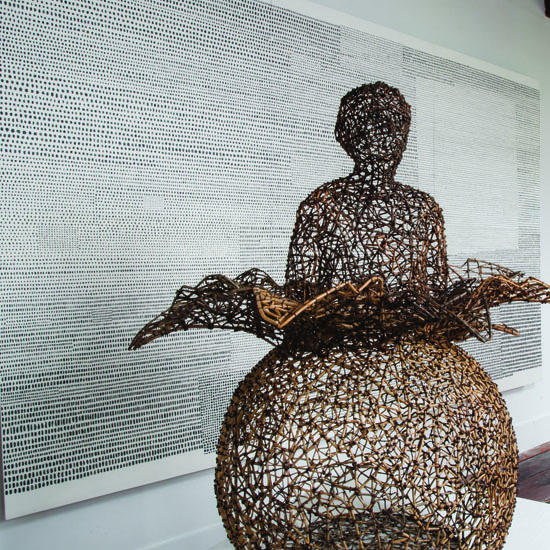 The exhibition will also include artists whose work complements our art textile emphasis, including sculptor Lawrence LaBianca and ceramicist Yasuhisa Kohyama. The Artists Reception and Opening for Retro/Prospective: 25+ Years of Art Textiles and Sculpture will be held Saturday, October 27, 2012 from 1:00 to 5:00 p.m. at browngrotta arts, 276 Ridgefield Road, Wilton, Connecticut. From October 28th through November 4th, the exhibition will be open from 10:00 a.m. to 5 p.m. For more information, call 203-834-0623; email: art@browngrotta.com or visit browngrotta.com. 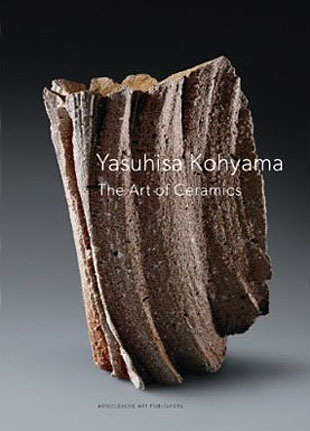 A catalog will accompany the exhibit and be available after the opening. Details of Adela Akers 1988 Midnight and 2011 Triptych. 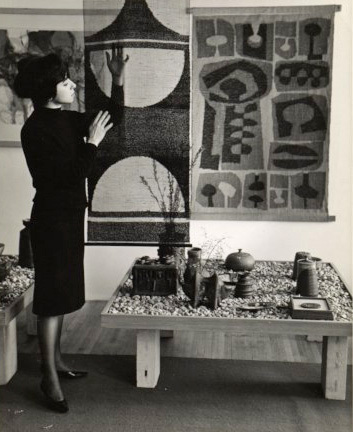 Adela is one of the artists who was included in the 1977 Fiberworks exhibition at the Cleveland Museum of Art. 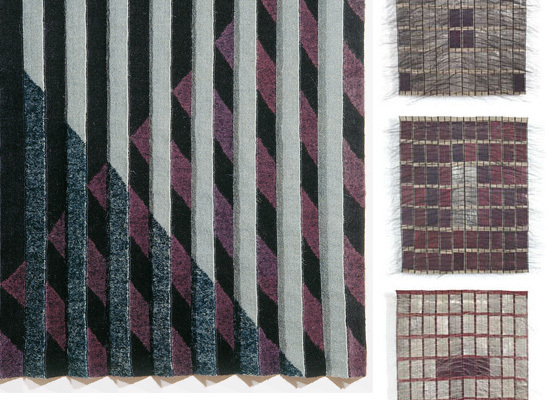 Her work will be included in Retro/Prospective: 25+ Years of Art Textiles and Sculpture this fall at browngrotta arts. “The 20th century has been a period of numerous experiments in the arts based on new concepts, materials and techniques which have proliferated as never before in history. Some of these new developments, however, have been only fashionable and have been inappropriate exploitations of materials or techniques for very vague and general ideas. 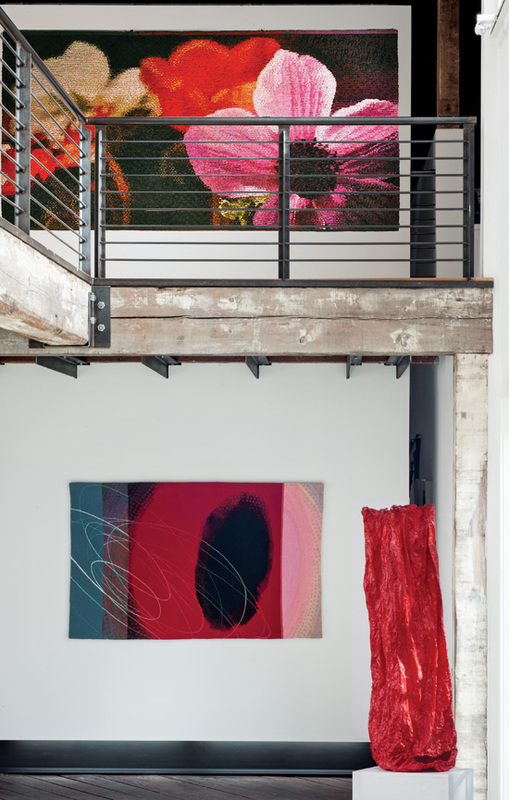 Among the exceptions to these trends, enjoying widespread and lasting success, has been the use of fibrous materials to create aesthetic equivalents of sculptures and paintings. Adela Akers 1960 portrait. Photo Archives of American Art, aaa.si.edu. Courtesy of the artist.